WomanSpeak provides the most innovative, effective training for women speakers & leaders in the world. Get paid to lead a WomanSpeak Circle in your community, and get trained to do it for FREE. Yep. That’s right. We train the right women for free. And did we mention how fun it is? No public speaking experience necessary. If you are entrepreneurial and passionate about helping women share their voices & deepen their leadership, you can bring this incredible experience to your community of friends and colleagues. Circles can be held in your living room, your local community center, in office meeting rooms after hours…anywhere with enough space to hold up to 20 women. And you don’t have to figure this out alone! We train and support you in becoming successful. Plus, we give lots of high fives and are big on cheering for each other. Join founder KC Baker in a mission to unleash the brilliance of women’s voices. We believe that the growth of women’s leadership is essential to the future well-being of our world. Supporting women in speaking up – and speaking well – is essential to the development of their leadership and success. Make recurring monthly income doing work that is fun and has a positive impact on the world. What’s better than that? We have in-depth online and live training, mentor support, and a rich community of other WomanSpeak Circle Leaders committed to supporting one another in their success. The culture of our circles is filled with celebration & support. We encourage women to be fully who they are and to speak straight from the heart with clarity and power. In running a WomanSpeak Circle in your local community, you are helping to empower and support women in becoming powerful communicators and leaders. We provide all the curriculum and training videos for your Circle members – you simply must provide a safe and supportive space for them to practice by learning the trademark methods of facilitation that have made WomanSpeak so popular and such a success. For every woman who joins your circle, a teenage girl is supported in the development of her voice and leadership through our signature pro-bono program, GirlSpeak. Once you have trained to become a WomanSpeak Circle Leader and have lead a circle for six months, you can apply to lead a GirlSpeak training in your area. We provide top-notch training and support. We have in-depth online and live training, mentor support, and a rich community of other WomanSpeak Circle Leaders committed to supporting one another in their success. We teach you essential facilitation practices for running your circles, marketing, and more. WomanSpeak has quickly become one of the favourite aspects of my coaching business. I’m witnessing miracles every fortnight as the women in our circle blossom into confident speakers. The training provided by KC and team is top notch and the ongoing level of support and connection from our leader community is incredible. The fact that I get paid to be part of this worldwide movement is a bonus! BEING A WOMANSPEAK LEADER IS FULFILLING. My experience in my circle has touched my heart so deeply to watch my members transform right before my eyes in such a short amount of time. When I ask them if they have experienced any changes in their lives they are quick to say YES and go on to tell me that they have noticed: more clarity in their message, more clarity in expressing themselves to others, more confidence in delivering their message both on stage and in conversations, more connection not only in our circle but with others. Our circle has co-created such a strong community of support for each other. The members value the celebrations and reflections because it reflects back to them their brilliance and how they appear to others in the world, supporting them in owning their own brilliance. Where else can you find this? As a leader, it seems that I am receiving all the same benefits as all of them! Very interesting! I wasn’t expecting that at all, Bonus!! WHO CAN BECOME A WOMANSPEAK CIRCLE LEADER? If you believe it’s time for a model of leadership that supports women in being themselves as they speak up and lead, rather than feeling like they have to suppress parts of themselves or their femininity to be taken seriously, then you are the leader we are looking for. Being a WomanSpeak Leader is fulfilling – for the heart and the bank account. WomanSpeak Leaders run two in-person circles per month ongoingly. Members can join at any time, and they pay an initiation fee (which covers their support of a girl attending GirlSpeak) and a monthly recurring membership fee to participate. Leaders make a large commission on members’ monthly membership dues. That means you can build your circle (or circles) to provide you with meaningful recurring revenue each month. (We recommend a cap of 20 members per circle). Plus, for any new leader you refer, you make an affiliate commission on their members’ monthly membership dues. HOW DO I MAKE MONEY AS A WOMANSPEAK LEADER? Leaders make recurring monthly income in WomanSpeak from commissions on their members monthly dues, and can earn $500-3000+ per month. This is fantastic given that it only takes about 4-5 hours of their time per month to run their 2 circle meetings. Leaders can run one circle, or many circles, and can have up to 20 members in a circle. Based on the number of members the leader has in her circle, she makes a commission of 50-65% on her members monthly dues. If a leader refers a new leader, that referring leader makes a 5% affiliate commission on the new leader’s members’ monthly membership dues on-goingly. We love this model because it allows Leaders to make great money, and to be invested in the growth of WomanSpeak and the success of other Leaders. HOW DO I BECOME A WOMANSPEAK CIRCLE LEADER? If you are approved to become a WomanSpeak Circle Leader, we will train you for free. That’s right. FREE. While we cannot take everyone, we want to make sure there is no barrier to entry for any woman we take on as a new WomanSpeak Circle Leader. In order to start filling and running your WomanSpeak Circle, you will go through our mandatory three week online training program that includes three virtual group training calls. We will teach you WomanSpeak’s innovative, effective transformational group facilitation skills. Our programs and culture are world renowned, so this is an incredible way to deepen your own leadership and coaching skills. Our training for leaders includes three weeks of initial deep dive training, all materials and curriculum for running your circles, your sales page and other marketing materials, your presence on our WomanSpeak.com website where potential members can find you, ongoing training and support, and a vibrant, supportive community of other leaders across the world. Once you have completed your training, you can begin enrolling women into your circle. In order to cover our team’s cost in running the training program and setting you up with your personalized sales page and all the marketing and support tools we provide, we withhold the first monthly payment of your first two members. Then you receive your regular commission on all members monthly memberships forever going forward. This way, it costs you nothing up front to get trained and rolling in running your Circle, so there is no risk to you. At WomanSpeak, we will continue to offer you incredible support, mentorship, training and encouragement as you flourish as a leader. You will be required to complete a 3-week online training course. During this time you will receive group training with a mentor through live video. We have detailed curriculum manuals for leaders and members to help guide circles. We support you with fully implemented training along the way. Our online Leaders Hub provides training materials, images, marketing materials, recorded training calls and more. All leaders receive their own sales page with a unique URL which features your profile photo and a short biography. Your sales page also lets people know when you are holding your circles and where, and allows them to register. All leaders receive personalized business cards and flyers for marketing purposes. The WomanSpeak business cards will have your name, email and phone number on the back. Our onboarding process for new members allows them to register for your circle online securely with a credit card. Leaders receive ongoing support as long as they remain certified. We offer monthly training calls and have a very active Facebook community. Circle leaders get access to a private Facebook group only for leaders. This serves as a great online platform to meet other leaders and talk about strategies, marketing, running your circles and more. We feature your circle on WomanSpeak.com so that potential members can find you through our advertising efforts, as well as your own. 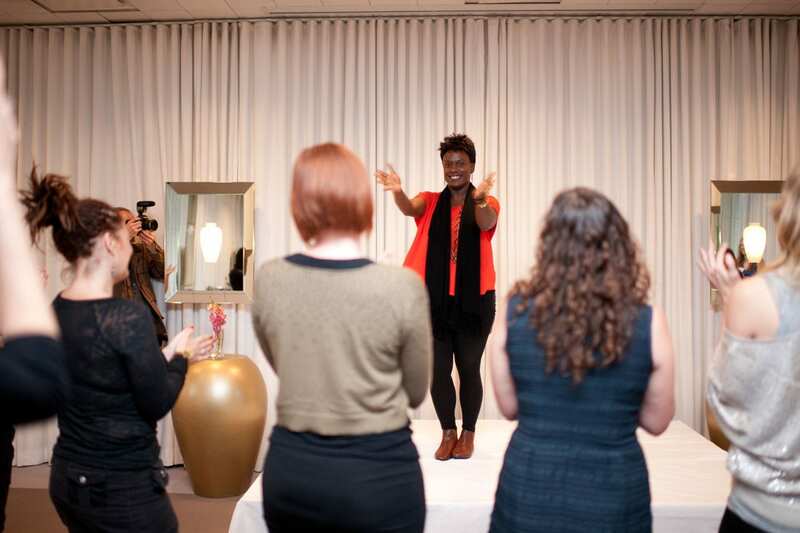 As a WomanSpeak Circle Leader, you will be part of an international movement committed to supporting women and girls in becoming powerful, effective speakers and leaders… and to having fun in the process! We would love to hear from you. Simply fill out an application and we will be in touch soon. Click the button above to fill out our online application. Our team will review your application within 48 hours. We will then reach out to you to go over the next steps. Applying requires no commitment. I love leading my WomanSpeak Circle. The WomanSpeak process is so transformational. I love watching the women blossom and grow. Watching them learn to trust and express themselves is such an honor. I’ve witnessed members take bold steps in their personal lives and deliver amazing talks in our Circle. I always come away feeling energized and expansive after each Circle. We have so much fun even as we dig deep. I highly recommend WomanSpeak Circle Leadership. You will be part of the most wonderful sisterhood of powerful and passionate women making their mark on the world. You’ll be doing groundbreaking work and you’ll receive so much personal growth and professional satisfaction. In leading our Circle for the last many months, I have been blown away with the results the women in my Circle are experiencing during the evening and… the ripple effects of the techniques through the rest of their personal and professional lives is profound. I just want every woman I know to experience what we are experiencing. As a manager in the high tech industry in Silicon Valley, I often find myself working amongst men in technology who treat less technical roles with lack of respect (a challenge for the only 19% of women who are in technology compared to the 81% of men), and therefore find myself holding my voice back. I enrolled in KC Baker’s work because I know my value and uniqueness in what I bring to the industry, but struggled with my communication in sharing my voice. Coming back to the work this week has been effortless for me to share my ideas and voice, and I am surprised by how quickly I was able to implement KC’s teachings! Thank you KC, I am eternally grateful.